Thank you for purchasing the Synthrotek FOLD kit! This is an intermediate build. There are a lot of parts and some tight soldering at the transistor and voltage regulator pads. A fine solder tip is recommended. It is very important to get all the components properly soldered into the PCB in the correct placement. If you feel like you can handle it, please proceed! If not, get some help from a friend with experience or purchase a fully completed unit. 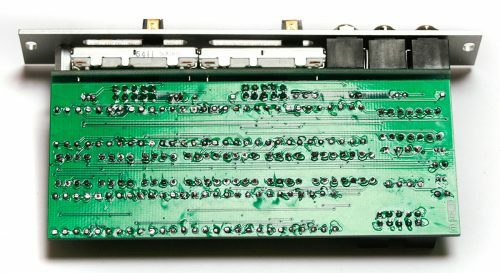 Populate the resistors on the logic board. Resistors are non polarized, so it doesn’t matter which direction you put them on the PCB, but it will help with any troubleshooting that may arise if you line up all the tolerance bands (usually a gold stripe) on one side. This will make it easier to read the color codes on the resistors. 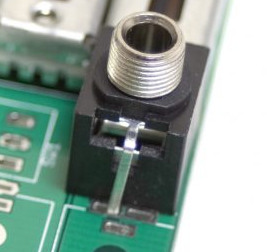 Next up are the IC sockets. Take care when populating these to not bend any of the legs, and to line up the notch in the end with the same notch that is displayed on the silkscreen. This notch indicates where pin 1 of the IC is. 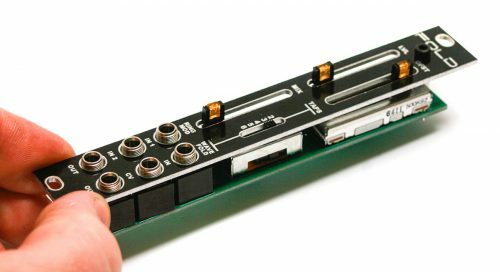 When you have them populated, carefully flip your project over and solder everything in place. Next up is the transistor and the 5v regulator. These are both polarized, so make sure when populating them that you align the flat edge of the component with the corresponding flat line on the silkscreen. 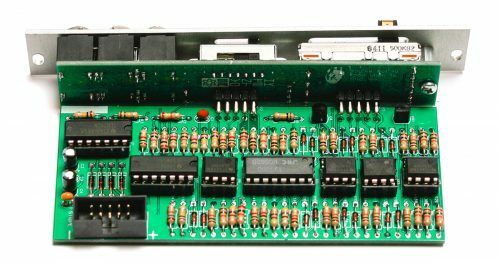 Also pay close attention to the number on the side of the component, as it is very easy to mix up the voltage regulator with the transistors, as they look alike. Be careful when soldering these in place that none of the legs create a solder bridge! Once everything is in its proper place according to the BOM, carefully flip your project over and solder everything in place, clipping any excess leads on the bottom. The transistor and voltage regulator pads are very close together! 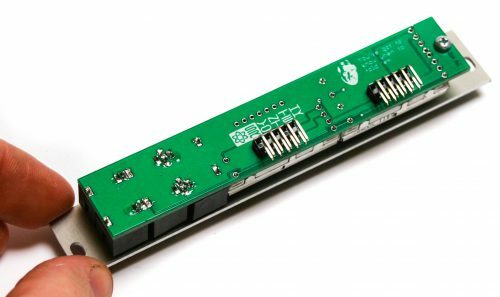 Please take extra time here to not make any solder bridges! One way to combat this is to solder one leg, then clip it, and then solder another and clip it, etc. A fine solder tip makes this much easier. Now we can populate the three ceramic capacitors. These are non-polarized and can be inserted either direction. If the capacitor coating runs down the legs a little, make sure the coating doesn’t poke into the pads. Once they are in, carefully flip over your project and solder them in place, clipping the excess leads. Finally, insert the ICs into their sockets. You will need to bend the legs inward a little to make them fit. Match up the notch on the IC’s with the notch on the socket and PCB silkscreen. Make sure that all the legs are firmly seated in the socket. Next up are the slide potentiometers, jacks and switch. 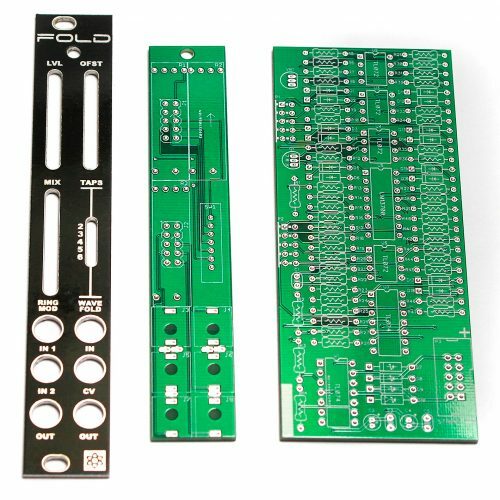 The pots will only fit in the PCB one way, but the legs can get a little bent during shipping or general handling, so take your time and make sure they all get fitted properly into their respective solder pads. The five-position switch can go in either way. Four of the six jacks have ground pins that are facing each other and need to be slightly bent over in order to fit (see photo above). Since these are ground pins, it’s ok if they are touching. Once everything is in place (but not soldered! ), carefully set the front panel down over everything. Next, grab your favorite tool (pliers not recommended!) and tighten down the nuts on the jacks (just barely!). If you are using a socket, tape the end of the socket so that you don’t scratch the panel. Then insert the black Allen head screw through the front panel and tighten it down on the standoff. Now you can turn the board over (carefully) and solder the legs in place. Take care not to create a solder bridge between the slide pots near the standoff hole, they are very close together. You will need to prop up the switch from the front in order to push the legs through. 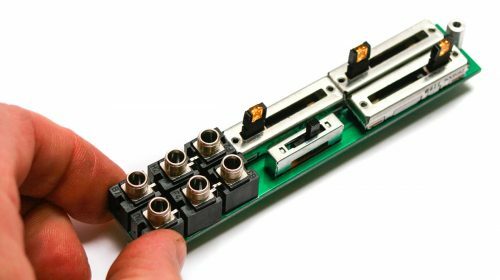 After you are happy with how it looks, solder the remaining pins, and then take your trusty clippers and clip the excess off the bottom of the pins so they don’t bump into another module when installed in your system. Let’s make sure it’s working correctly. A Eurorack system with a sine or triangle wave oscillator, a second audio signal and a CV source. 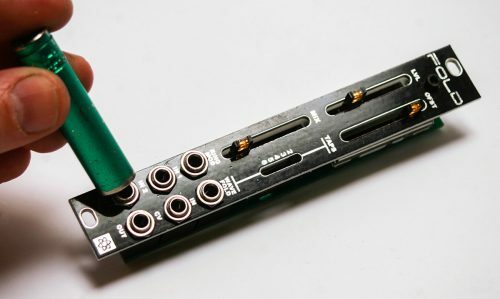 With your Eurorack system powered off, plug the FOLD into your eurorack power via the included 10 to 16 pin power cable. All three LEDs on the pots should light up. The ring mod circuit only uses the three bottom left jacks; none of the other jacks or controls apply to it. Patch two separate audio signals into IN 1 and IN 2. Patch the output into a mixer; the two signals should combine together. Some frequency combinations will sound better than others, so mess around with it a bit! Slide all the pots down to 0%. 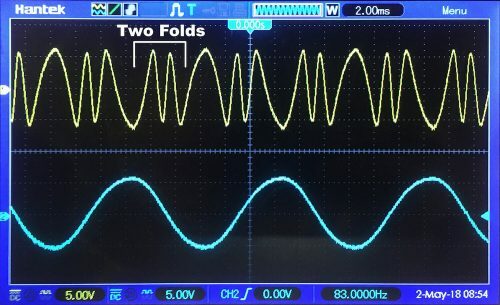 Plug a sine or triangle wave into WAVE FOLD IN jack. 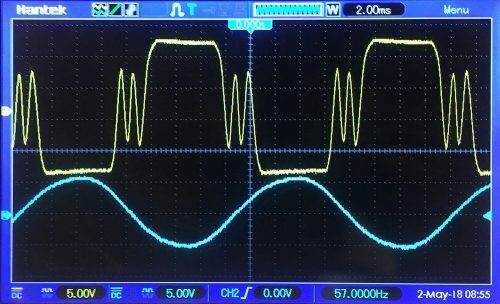 If using an oscilloscope: patch the right-side (wave folding side) OUT into a buffered mult input, and patch the outputs of the mult into your o-scope and output/line level mixer. With the MIX pot at 0%, you should have a dry signal. 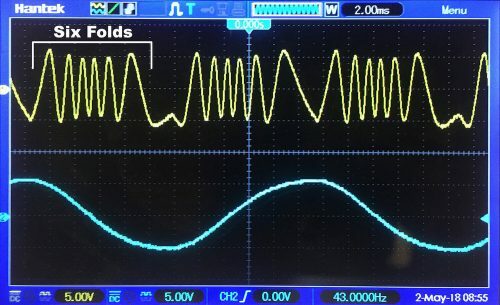 On the o-scope, you should see a normal triangle or sine wave. Slide the MIX pot to 100%. Your amplitude should flatline or come close to this. There should be little or no audible signal. The LVL increases the amplitude of the effected waveform or the waveform to be folded until it folds. This pot will not function unless the MIX pot is above 0%. Note: the blue waveform in the pictures below is the original waveform. The CV input responds to both positive and negative voltage. Plug a positive CV source into the CV jack and move the LVL pot to 0%. When the LVL pot is at 0%, 0V to +5V will emulate the full travel of the pot. When the LVL pot is at 100%, 0V to -5V will emulate the full travel of the pot down to 0%. Slide the LVL pot to 100%. The positive voltage will push past the limits of the LVL pot. Unpatch the CV input; the LVL should audibly change back to its normal 100%. The OFST pot controls the offset. This pot will not function unless both the MIX and LVL pots are above 0%. It can’t be used to offset the dry signal alone. The OFST pot can adjust the folded wave up or down to help achieve the desired timbre and wave symmetry and can make folded waves clip. Adjust to taste. Congratulations on your completed FOLD module! Go make some music!